The reasons for the Gallipoli Campaign were rooted in the events of 1914 and, like many, if not most, my family were involved. It may seem self-indulgent to concentrate attention on one battalion and one family, but a true picture of war needs a close up look at the effects on individuals as well a the wide angle view of large armies on the move. The hope is that those individuals may in some measure represent the experience of those who are otherwise ignored. As it happens, my mother’s brother, Arthur Flemming, passed through Stretton [Stretton on Dunsmore, the village where Tony lives] on the day war started. He left a diary and told how on that day he was cycling from Coventry to London. He took shelter from the rain under a railway bridge and was told the news of war’s outbreak by other shelterers. He was a reservist with the 3rd Coldstream battalion and within a few days was at the front near Mons. And, as a corporal in charge of a machine gun unit, he was deeply engaged in ferocious battle within three weeks. Those first engagements of the war brought the military theories of three nations into bloody conflict with the new nature of modern war and hundreds of thousands died because of the gap between theory and reality. The French climbed the learning curve at greatest cost. Before the war, their military theorists had forcefully taught that only aggressive spirit won wars: imprudence became a virtue. This was the doctrine of offensive à outrance. It reckoned not with the new reality of machine guns and barbed wire: the balance had shifted firmly in favour of the defensive. About four hundred thousand Frenchmen lost their lives in reckless attacks in those early weeks. Colonel de Grandmaison had done for them all with his plan of attack. The German Schlieffen Plan embodied a less extreme version of the same concept. It envisaged a powerful right hook by two strong armies, passing through the part of the front held by the British, leading to the envelopment of Paris and a swift conclusion of the War. The British army — “contemptible” was the Kaiser’s word — was not held in high regard; it was thought that they had shown a lack of rifle skill against Boer farmers a decade or so earlier. In the event, chance and practice favoured the British. Their allocated role at Mons was defensive, which was fortunate. And, precisely because of the lesson learned from the Boers, they had practised formidable rifle skills. Fifteen rounds a minute was the claim. Now, if you have ever operated the Lee Enfield 303, you will know that this is a supreme claim: up with bolt to gather the cartridge; forward to push it into the barrel; aim; take up finger pressure; fire; bolt back to eject cartridge case; bolt down to collect the next cartridge. All in 4 seconds. Germans have testified to this murderous firepower. 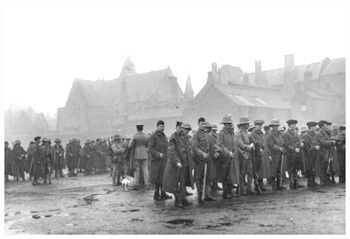 At Mons, the mass of grey uniforms met British bullets and recoiled. Many believed that each British soldier was equipped with a machine gun. But at the same time the French, on the British right, were recoiling, badly mauled from their frustrated attacks. As they retreated, they left the British flanks unprotected so the British, in their turn, had to retreat. Thus began the Retreat from Mons: days of hard marching, interspersed with fierce fighting engagements, costly to both sides. Two days later, Arthur Flemming recorded just such an untoward incident. The Guards Division, dog-tired and foot-weary, paused to rest for the night at Landrecies. They were suddenly pulled from their rest by an urgent alarm when the small town was attacked by German cavalry. Arthur’s machine gun was set up in the main approach road and they became part of a fierce close engagement, with hastily erected barricades of carts and wagons, weirdly illuminated by the light of a burning haystack. The fighting went on till early morning when the Germans withdrew, leaving 800 dead and a badly damaged 3rd Coldstream battalion. The High Command distinguished themselves less well: Haig, the Corps Commander, sent a panicky call for help to GHQ, which caused one general to faint. However, the German advance was no victorious strut. Thirty-two days from Mons to Marne took their toll. Their ragged, dust-covered soldiers, with boots worn thin, were suffering. And their commanders were having to face the fact that retreating French and British armies, far from being annihilated, were withdrawing in good order, powers of resistance intact, while they themselves were outrunning supply trains. The critical Battle of the Marne was about to test both sides. If the Allied position was still precarious, the odds were changing in their favour. And in Joffre they found the man for the hour. The counter attack he organised, after days of fierce but indecisive conflict, eventually turned retreaters into advancers, advancers into retreaters. And those on both sides have recorded the profound change in morale in both armies. Roles were now reversed. The Germans retreated to prepared defensive positions north of the River Aisne. The Allies advanced, only to be checked by the German static defences. It was the end of the short period of mobile warfare. Each side tried to outflank the other; each failed. And the line was extended until mutually repelling static defences stretched from the Alps to the English Channel. There was still to be a time of crisis in October, before Ypres, when the Germans almost achieved breakthrough. And there, as it happened, another of my mother’s brothers, Alf Flemming, was involved in an episode of high drama, which cost him his life. The situation was roughly as follows. The High Command of both sides still entertained unreal pipedreams of breakthrough. The ancient textile town of Ypres, an important road junction, was the key to the northern front. From Ypres, the Menin road led to the front through the village of Gheluvelt, about five miles away. Between the two was Hooge Chateau, divisional HQ. Breakthrough at Gheluvelt was a prize that could have allowed the Germans to outflank the entire British army and open the way to the Channel Ports. In late October, a series of attacks were resisted at high cost to both sides. On the morning of the 31st, the Germans launched a massive attack with seven fresh divisions and Gheluvelt fell. One of those involved on the German side was Adolf Hitler, who had had received his baptism of fire on the Menin Road two days before. That same day, a shell hit Chateau Hooge HQ. The Commander in Chief, Sir John French, looked disaster in the face and wrote later that it was the worst half hour of his life. Haig prepared orders for retirement. In the afternoon, 1st S. Wales Borderers had counter attacked, regaining a small part of the old position. Their position was precarious, with small chance of holding on without reinforcement. And reinforcements there were none. No reserves left, except for one depleted battalion of 2nd Worcesters. About 350 men, a third of full strength. It was enough. Led by Major Hankey, the Worcesters moved up and put in a charge over a thousand yards of open ground. This caught the Germans relaxing after success and drove them off. It is one of the most celebrated actions of the entire War and Sir John French said that on that day 2nd Worcesters saved the Empire. Not without cost. More than half those in the charge were casualties. 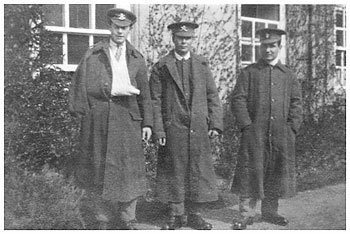 Alf Flemming died of wounds in German hands the next day. He left a young wife and infant son. There was a strange postscript. 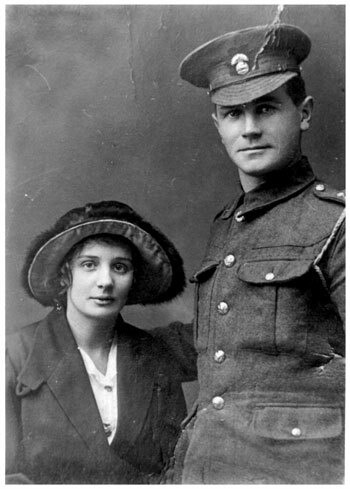 Some time later, Alf’s wife received a letter of condolence from a German soldier, which said — when they had found someone to translate it — that Alf had died in his arms. That day, for those with the wit to realise it, signalled the end of the dream of breakthrough, although the lesson was slow to be learned by some in command and many paid with their lives for such mental rigidity. Machine gun and barbed wire between them left only the prospect of stalemate and endless indecisive trench warfare. And Winston was one of the few to give deep thought to the new military problem. He was looking for some alternative to what he described as sending the new armies “to chew barbed wire”. The Gallipoli campaign was the result. He is always unconsciously playing a part — a heroic part. And he is himself his most astonished spectator. He sees himself moving through the smoke of battle — triumphant, terrible, his brow clothed in thunder, his legions looking to him for victory, and not looking in vain. In the theatre of his mind it is always the hour of fate and the crack of dawn. These characteristics were to be stamped on the Gallipoli campaign. The Munsters arrived at the harbour of Mudros, on the island of Lemnos, on the 10th of April. They looked with awe at the great armada of ships assembled there: French and Russian as well as British. Among the black ships there moved strangely rigged Greek boats, with peasant food for sale: meat and fish and wine. They were at Mudros for two weeks — longer than expected because of unsettled weather, unsuitable for the planned landings. Time for more training and practice for what was expected to come. Hamilton had done what he could, with what he had, to plan the landings, but what he had was little enough. Above all he lacked time. In the day or two available before leaving London, he had gathered a tourist book and a map. That map, somehow, symbolises the core problem of the entire campaign. It was drawn up sixty years before, for the Crimean War. The contours are few and far apart, no detail, deeply misleading. Now, for skilled map-readers, contours tell the story: contours far apart tell of a gentle terrain, easy for an army to stroll over, exactly opposite the reality of the jagged resistance offered by the actual landscape. In London, details of geography would not matter. Reality was different. The devil is in the detail. Hamilton’s plan called for diversionary attacks on the Asian shore of the Dardenelles; for landings by the Anzacs in the north of the peninsula and for five landings: S, V, W, X, and Y around the southern tip. On Friday, the 23rd of April, the weather cleared, and ship after ship, crammed with soldiers, began to move out of Mudros harbour. Geddes recorded that at 5.30 P.M. on that day the Munsters left for the great adventure. A perfect evening, he says, with solemnity and grandeur, cheering from the crews and bands playing. What struck me most forcibly was the demeanour of our own men, from whom, not a sound, and this from the light hearted, devil-may-care men from the South of Ireland. Even they were filled with a sense of something impending which was quite beyond their ken. When I asked for this ship, my joy in it was half strangled by that you said, I can’t even name it or talk about it. As we go steaming in under the port guns in our rotten old collier, shall I think about it: Don’t do it. Time is nothing, we join up again, but to hurry the pace is unworthy of us all. … the beauty and the exultation of the youth upon them like sacred things as they moved away ‘ All that they felt was a gladness of exultation that their young courage was to be used … Till all the life in the harbour was giving thanks that it could go to death rejoicing. All was beautiful in that gladness of men about to die, but the most moving thing was the greatness of their generous hearts. The next day the Munsters were taken aboard the River Clyde. Geddes was lucky to be given hot chocolate and a shake down on his cabin floor by Commander Josiah Wedgwood, socialist M.P. and Navy Volunteer Reserve Officer. He had a pleasant night’s rest. Beautiful dawn on the 25th, a slight haze but not a breath of wind. The day of the landings had arrived. Now, some landings were to be much harder than others. None were picnics and, in particular, the exploits of the Lancashire Fusiliers, on W Beach, have been properly acclaimed. But there can be no doubt that those on board the River Clyde drew the short straw. Masefield described the landing on V beach as the worst and bloodiest of all the landings. Commander Unwin’s plan for the assault was clever and ingenious, but would it work’ The River Clyde, an old collier, was his Trojan Horse. Armoured cars, in sandbagged emplacements, were strapped on deck to provide gun cover. Ports had been cut in her sides from which the men would emerge and gangways built out for them to run down. The Clyde was to be beached as near to the shore as possible and a string of lighter, barge-like vessels, which she towed, would form a bridge to the shore. At the same time, other vessels, with most of 1st Dublins aboard would be towed fairly close inshore and row the rest of the way. On board the Clyde were the four companies of Munsters, two of 1st Hampshires and one of 1st Dublins. About 2100 men. V Beach was a narrow crescent, about 300 yards across, a natural amphitheatre: on the left, steep cliffs about fifty feet high, say twice the height of an average house; on the right, an old Fort; beyond that, the village of Sedd-el Bahr. Little cover for those landing; natural defences for the Turks. And Liman Von Sanders and the Turks had used their time effectively. Well-concealed trenches and formidable barbed wire — under the water as well as on the beach. At 0500 the naval bombardment began. Churchill had used the power of the naval guns as an argument in pressing the merits of the campaign. He was wrong. The low trajectory of naval guns, compared to the dropping arc of land artillery, was less effective. The Turks were well spread out and little disturbed. They were disciplined, held their fire, and waited. They were not numerous; they did not need to be. Four machine guns, well placed, and a few score rifles, would be ample. At 6.25 the River Clyde beached, with no jar. As she did so, the boats of the Dubliners came in alongside. They were met with a violent fury of rifle and machine gun fire. Geddes and Tizard saw the carnage with horrified apprehension. Slaughtered like rats in a trap, said Geddes. Many were killed or wounded in the boats; some were knocked into the water and tried to get a little protection by clinging to the sides of the boats; some tried to make it, up to their necks in the water; many drowned; some came back to rescue a mate, only to lose their own lives. A Navy flier saw the water, red with blood, for fifty yards from shore. A few made it to the shore and found protection behind a small bank of sand. Then the turn of the Munsters. X company, under Captain Geddes, on the port side; Z company, under Captain Henderson, on the starboard; Y company under Major Jarrett in support; W company, under Major Hutchinson, in reserve, on the River Clyde. But first there were problems to be cleared up. The steam hopper towing the bridge of barges broke away, or got shot away, and the barges finished crossways in front of the Clyde. They were pulled back into place, under murderous fire, by Unwin and naval crew-members, with help from Fusiliers. Knowing the exact point where the men were going to emerge, the Turks had a fixed and easy target. Someone counted the first 48 men to follow Geddes: all fell. Lieut. O’Sullivan, the bridegroom of January, fell. His best man, Lieut. 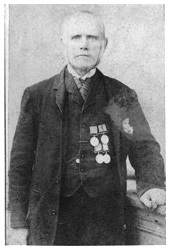 Watts, wounded in five places, cheered the men on with cries of “follow the Captain”. The barges gave trouble again, drifting in the strong current. Geddes, finding himself alone, had to jump into the sea and swim ashore. Many others who tried this drowned because of the great weight they were carrying: 84 lbs; full pack, 250 rounds of ammunition; 3 days rations. Henderson’s company on the starboard side fared no better; Henderson himself was badly hit. He died from his wounds later. The lighters became piled with dead and wounded; those following had to run over heaped bodies. Few, very few, made it to the shore and the protection of that little bank of sand. The landing was repulsed and the Turkish fire ceased at about 0800. There was, for a while, silence. At about 0900, Tizard tried again, sending Major Jarrett and some of Y company. There was a spit of rock, which looked like a good spot to head for, but the enemy had got its range nicely, and it was a death trap. Few made it to the sheltering sandbank. Hunter-Weston, divisional commander, had concentrated all his attention on W beach, to the complete exclusion of all other landings. Opposition there had been overcome. Hamilton, from his vantage point at sea, was aware of the problems on V beach and could see the advantage of diverting troops to W Beach. With his usual diffidence and unwillingness to interfere, he made this a question to Hunter-Weston, rather than an order, and it was ignored. Later, Tizard, on the Clyde, spotted men from the next beach on the cliffs to his left. He sent a message to Divisional HQ, asking that they be used to outflank the Turkish defences. His message was ignored. Later came an order to continue with the landings, so Tizard unwillingly sent another company of Hampshires. Again the barge closest to the shore had become detached, so the Hampshires were halted. General Napier and his brigade major went to investigate and both were killed by shellfire. Nightingale watched Napier die. Guy Nightingale was sent to join Jarrett’s company. He managed to get through the sea despite the bullets. Jarrett sent him back to the Clyde to advise Tizard not to send more men in daylight. Tizard took this advice, despite Hunter-Weston’s order. Nightingale went back to the beach. Jarrett and he organised the few unwounded to set up some sort of defence. Jarrett was killed; Geddes was, by now, suffering too badly from wounds to do much. So the day passed, somehow, with cries of wounded under the searing sun. At about 1700, it grew dark. The remainder of the troops on the Clyde could now get ashore safely. Geddes was evacuated to the Clyde and taken aboard a hospital boat next morning. Tizard said that before the landing it had been surmised “that by 8 a.m. the ground above the beaches would have been won; by noon we should be in the vicinity of the village of Krithia, and have taken the Hill of Achi Baba that night.” These objectives were never reached in the eight months of the Gallipoli campaign. Night would bring no rest for the survivors. At midnight, Hunter-Weston ordered that the advance should be continued.